The designers at Alyce crafted this beautiful high-low wedding-guest dress in gleaming taffeta that will stand out at your next formal event. 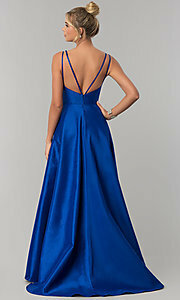 The gorgeous long evening dress features a ruched bodice with surplice v-neckline. Double spaghetti straps drape over the shoulders and fan out across the open back for a sultry look on this lovely long dress. The a-line skirt flows to the floor in soft waves of taffeta with a unique high-low slit to one side. An elegant style for pageants, winter formals, or prom, this glamorous long wedding-guest dress, under $250, is a figure-flattering style that remains affordable. The model wearing red is 5'9" and wearing 2.5" heels.